You can test drive a car, so why not retirement? InternationalLiving.com, a magazine and website with a self-explanatory name, is holding a contest to "test drive" retirement in Nicaragua for a month – all expenses paid.That includes airfare and rent for the winner and a spouse or friend, plus $1,500 for extra spending money. 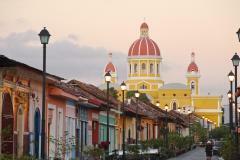 Nicaragua routinely makes "best places to retire overseas" lists, with its tropical climate, picturesque landscape with beaches, rainforest and volcanoes, Spanish colonial architecture and the piece de resistance – its low cost of living. Actually, International Living describes it as a "super-low cost of living," where you can live well on $700 a month, and real estate is "a fraction of what you'd pay in the U.S. for similar locations." "I have a bit of an embarrassing problem every time I go to Nicaragua," Jason Holland wrote on InternationalLiving.com. "For at least half the first day, I'm constantly asking waiters to repeat the price for a beer,cocktail or meal, thinking I misheard. Could it really be that low?" He reported that a steak dinner for three in Granada, complete with wine, cost $45 — and that was the most expensive meal he had there. Mojitos and other drinks are about $1.50 around town, he reports, and Tona beer costs 75 cents. 75 cents – what year is this? Does Marty McFly know about this? Now that your interest is piqued (at the very least, your wallet's interest) you're probably wondering what the "requirements" are for a retirement contest. I mean, if this were a basketball contest, you'd win by being good at sinking baskets. What exactly is the skill set you need to get an edge in a retirement contest?! First, applicants "must be willing to relax," the ad on InternationalLiving.com says. "Must be willing to relax... explore a new place... shop the local farmers and craft markets... take walks... attend festivals... maybe try a Spanish class... enjoy local restaurants... make new friends. Ideal candidate is of (or close to) retirement age, hails from the U.S. or Canada, and believes that – in the right places overseas – it's possible to live better, for less," the ad says. Applicants were asked to submit a three-minute video on YouTube on why they should get the free test drive. "I am 63-years old and am living on a fixed income. I collect Social Security and I also have a military retirement," said Roger Wollschlager, playing it straight in his YouTube video. "If I can live in Nicaragua and the cost of living is a lot cheaper, then I can stretch my retirement dollars a lot further." Sue and Keith Farndale from Toronto, Canada were a quaint comedic duo in their YouTube video, with Keith playing reporter and interviewing Sue on why they should win. "We'd like to win a dream test drive test-drive retirement overseas with International Living and we're going to tell you why!" Keith says in the intro. "First, welcome to the beach neighborhood of Toronto, Canada! It's gray. It's snowy. It's below freezing. Hey, maybe that's the reason!" He says, elbowing Sue. "Sue, what do you look for in a retirement destination? "Keith asks. "Nice weather and cheaper. And friendly people," Sue said. "I like the idea of learning another language. That's good for our brains as we age." Right on cue, Keith replies: Hablo espanol. Si, senora!" No reporting or writing experience is necessary but the winner must be willing to share reports of their experience. If International Living uses any of the material in their magazine, website or daily postcard e-letter,they'll offer additional compensation at the current writer's rate. Say, do you get paid extra if you "hablo espanol"?